North West Persian Rugs – is the area straddling the Caucasus mountains, Caspian sea and borders with South Asiaa. Rugs produced in North West Persia represent a convergence of cultures from the Kazakhs and Khazars to the invading Mughals. The region of N. West Persia includes parts of Iran, Azerbaijan and Armenia. Carpet weavers in N. West Persia were not the most prolific craftspeople but their rare high quality carpets are sought after commodities that regularly sell for record breaking sums. Historic evidence depicting looms and detailed carpet patterns confirms the development of knotted pile carpets and flat woven Kilim rugs during the Timurid dynasty which thrived between 1300 and 1500. 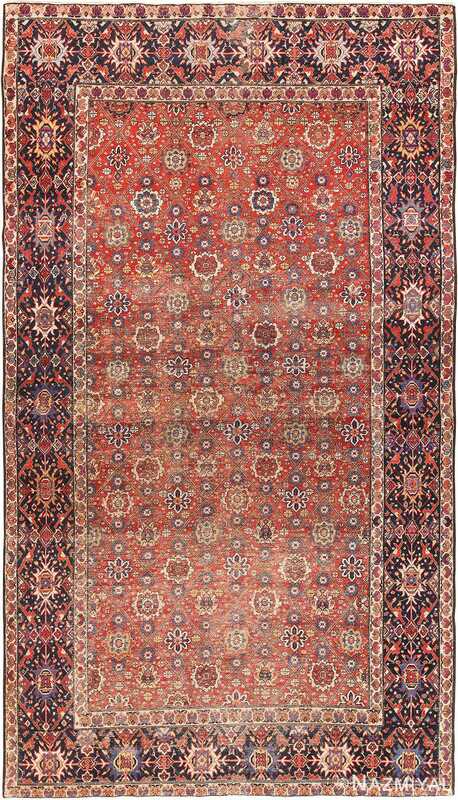 The oldest known carpet in the Northwest Persian style was produced in the city of Tabriz. It depicts a bountiful hunting scene with lush vegetation. This ancient pictorial carpet from Tabriz dates to the 16th century and the rule of the influential Shah Abbas. Before Shah Abbas overthrew the Safavid dynasty, their wealthy leaders funded a renaissance of the Islamic arts that would last more than a century. Carpets produced in Tabriz during this era were highly pictorial but also featured Islamic calligraphy, detailing folklore and writings from the famous Northwest Persian poets. Geometric patterns and bold colors were introduced to north west Persian carpets through tribal groups and nomads who traveled through the many fertile valleys of the south Caucasus. During the 17th century, carpet weavers from the port city of Baku, adapted their own style known as Khila Afshan. This style was based on geometric adaptations of the floral patterns produced in Tabriz. Unlike carpets from Tabriz, which used a variety of earth tones and low contrast colors rugs, the Khila Afshan rugs of Baku used brilliant reds blues and bright whites. According to historic evidence, the Kazakhs split off from Mongol tribes sometime during the 12th or 13th century. By the 15th century the conqueror Babur invaded sub continental India where he established the Mughal empire. The Muslim Mughals, who were an offshoot of the Timurid Dynasty, also influenced carpet design in Northwest Persia. Carpets from Heriz, in Northwest Persia, contain strikingly similar elements to those used by the Mughal carpet weavers. However, the serrated edges and accentuated coloration found in carpets from Heriz, are unique to Northwest Persia. Under the rule of the Seljuk Empire, the region of Kurdistan became intertwined with Western Persia. Throughout history, the Kurds have remained true to their heritage by faithfully preserving tribal symbols, dye recipes and weaving techniques. They ignored many of the time saving inventions that many areas had already adopted. Groups like the Kurds, were instrumental in maintaining elements like the classic Persian blue used in carpets from Bidjar and Western Iran. 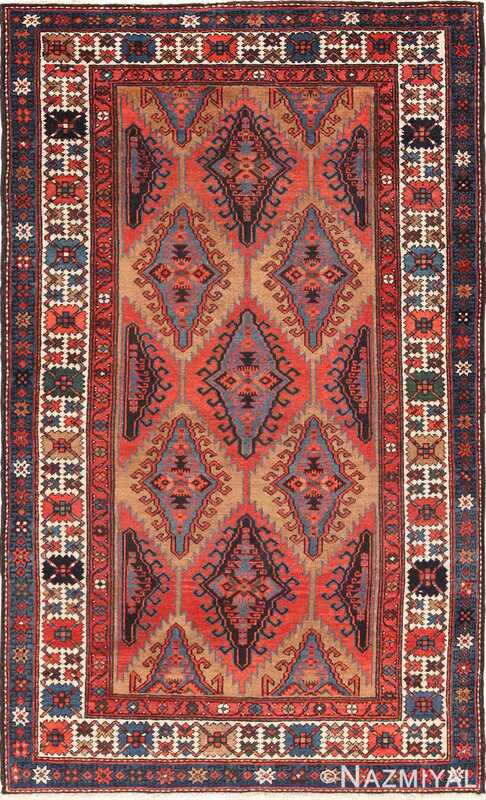 During the 19th century, the Kazakhs regained influence over carpet designs in Northwest Persia. According to official census documents from 1830, the vast majority of artisan dyers and carpet weavers in Northwest Persia were non native refugees who emigrated from Armenia (which was undergoing social turmoil as Russia conquered parts of that country). North West Persian carpet designs from the 19th century incorporate geometric elements from Armenian refugees as well as European elements (like all over lattice work seen in rugs from this region). The demand from foreign markets for the antique Persian rugs, during the 19th century, helped cities in Northwest Persia maintain their carpet making traditions. Major antique rug producing cities like Tabriz, flourished with the influx of European investments. Up until the first quarter of the 20th century, master weavers and luminaries, like Haji Jalili (of Tabriz) continued to produce elaborate designs that advanced the art of Northwest Persian carpet weaving and made the area’s designs legendary. These intriguing and highly decorative rugs were produced near the border between Safavid Persia, Turkey and the tribal lands of the Caucasus. The angular, rectilinear designs featured in these rugs visually confirm their geographic origin along the borders of these three regions that posses deeply contrasting styles. The Northwest Persian designation is a vague and sometimes controversial term due to the foggy history and political changes that took place in the region, but the designation is always corroborated by the style, structure and materials of these archaic pieces. The pile carpets and decorative Kilims produced in Persia’s northernmost province bear striking similarities between some Caucasian rugs and those produced in modern-day Azerbaijan. One common thread between the carpets of the Caucasus and those produced in the western Persian province of Azarbayjan-e-Gharbi and the informal area of Iranian Kurdistan is the presence of multi-ethnic weavers. Elegant Northwest Persian rugs are typically attributed to parts of Iranian Kurdistan and Azarbayjan-e-Gharbi. They feature rectilinear patterns, grand lozenges, dramatic harshang palmettes and large-scale arabesques that bear some similarity to the sophisticated carpets produced in Sultanabad and the cities along Persia’s western frontier. Political instability and continually changing borders pushed ethnic weavers between Persia, Turkey and the Caucasus. Centuries after Northwest Persian rugs were created, their style, structure and physical attributes reveal more about the area than many history books can. The rugs of North west Persia are the pure forerunners of the elegant and extremely popular rugs produced in Heriz, Serab, Ahar and other northern regions. 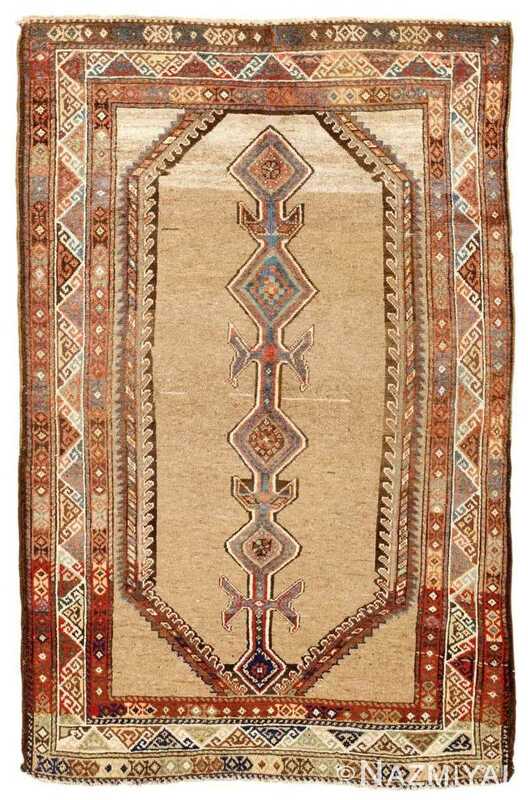 This handsome long and narrow carpet exemplifies the tribal aesthetics that make Northwest Persian rugs so unique and desirable to collectors. Characterized by an exciting tribal composition with stacked medallions, this delightful antique carpet is an excellent example of the Northwest Persian style. Symbolic figures and patterns imbued with a deeper meaning are used throughout this charming antique carpet woven in Northwest Persia.